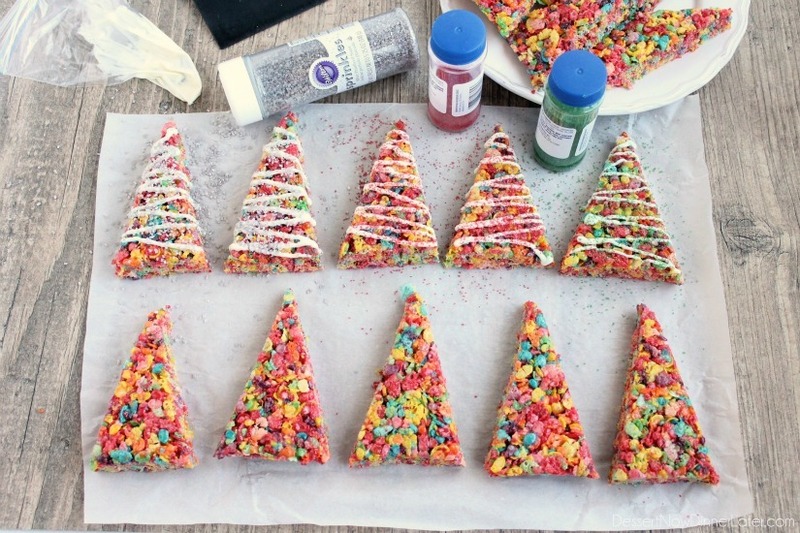 Krispie Treat Christmas Trees - Dessert Now, Dinner Later! ** This conversation has been sponsored by Fruity Pebbles. All thoughts and opinions are my own. 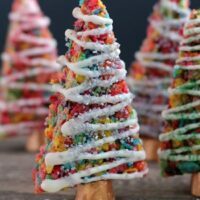 Fruity Pebbles cereal lights up these festive Krispie Treat Christmas Trees that are easy and fun to make for the holidays! My kids beg me to help bake things for our neighbors during the holidays. Well, my kids are 6 & 4 (minus the baby who is 6 months old) and so their kitchen skills aren’t very technical. 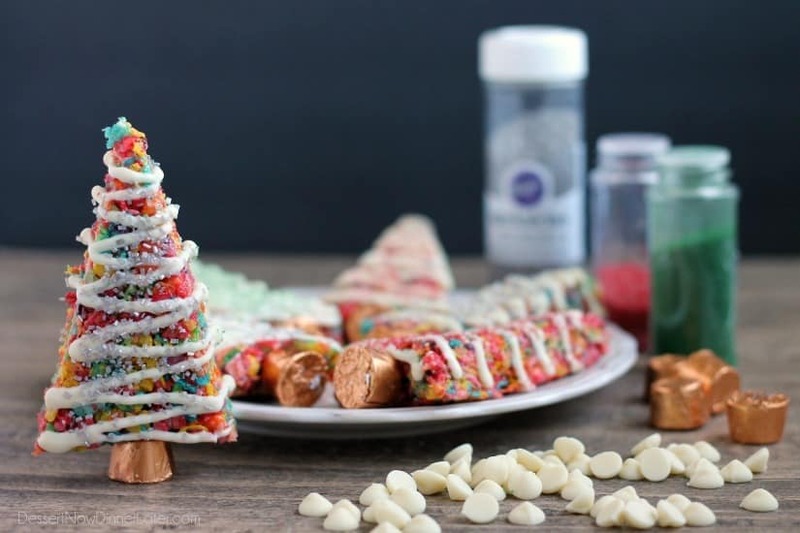 So, we looked in our cupboards and found something we could use to create a fun and easy holiday treat with, and we created these Krispie Treat Christmas Trees! 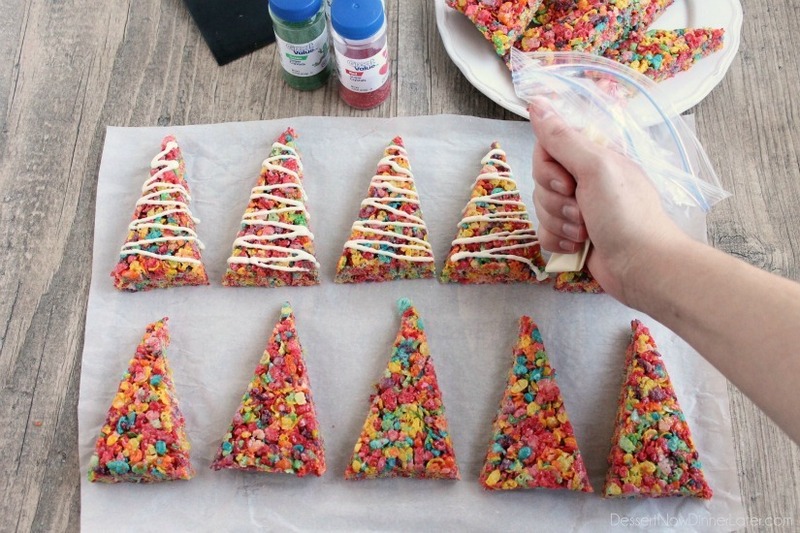 We used Fruity Pebbles to make krispie treats because they are colorful like lights on a Christmas tree. 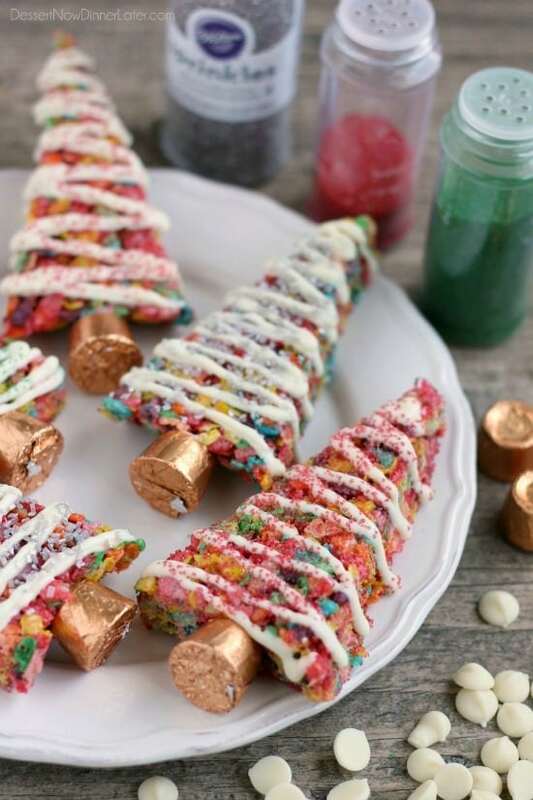 Then we used Rolos candy as the tree stumps, some melted white chocolate chips for the garland, and different colored sprinkles for decoration. They turned out great! 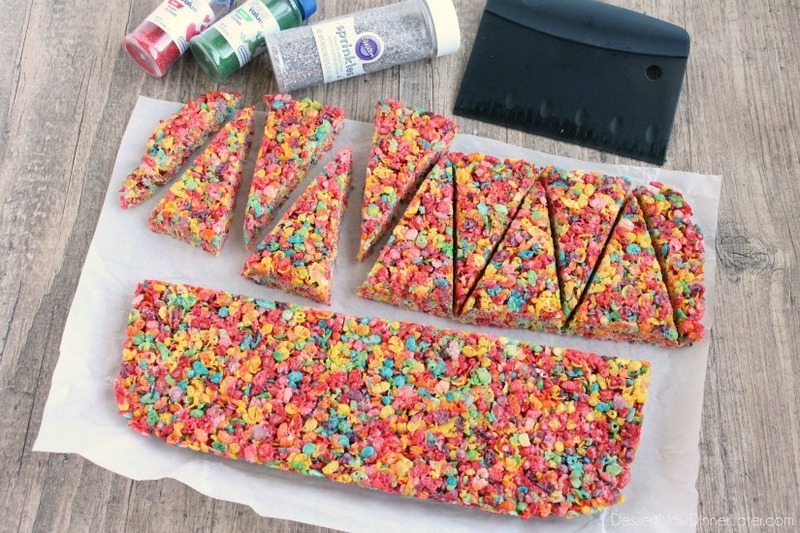 Make the fruity pebble krispie treats and put them in a 13×9-inch pan. I use parchment paper to pull the whole slab of cereal out of the dish. Then cut the cereal in half lengthwise. Then cut off one end at an angle and cut back and forth creating triangles. Place the triangles on parchment or wax paper. Heat 1 cup of white chocolate chips in the microwave with 1 tsp of coconut oil or shortening for thinning. Place melted chocolate in a zip-top bag and cut off the corner. Zig-zag the chocolate across each Christmas tree. 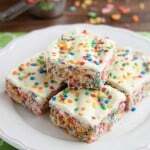 Immediately sprinkle the white chocolate with colored sprinkles. 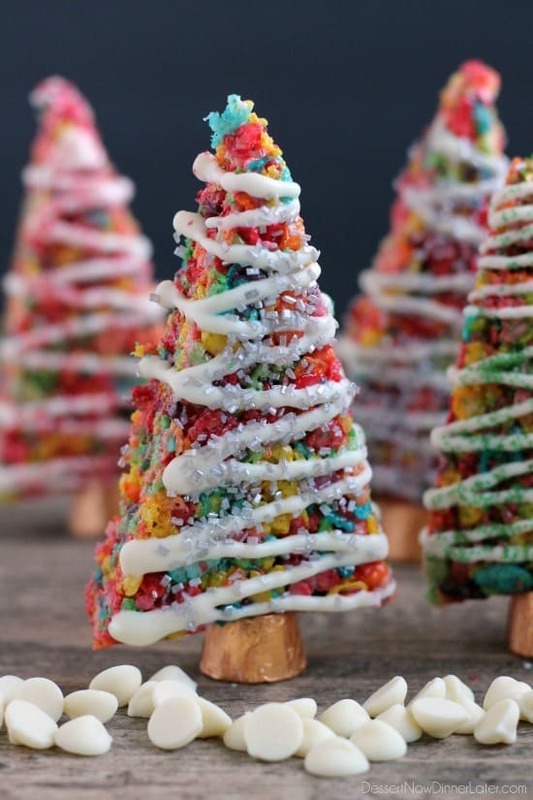 Attach the Rolo tree stumps onto the trees with a dab of melted white chocolate. Allow the chocolate to dry. Voila! Done! They turned out great! We were so excited to share these with our friends! They were festive, and easy! Think outside the bowl! 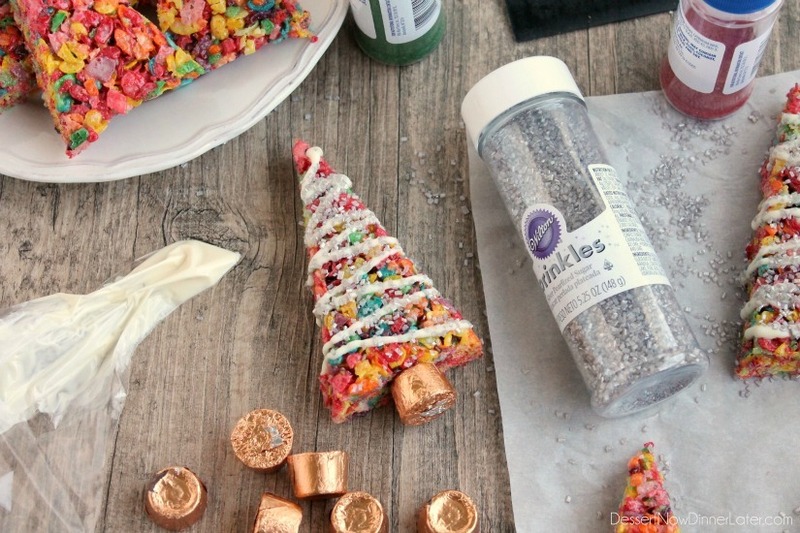 What would you make with Fruity Pebbles cereal? In a large non-stick stock pot, melt the butter. Add the marshmallows and stir constantly until melted. Remove melted marshmallows from heat. Add Fruity Pebbles cereal and stir/fold until the melted marshmallows are evenly distributed amongst the cereal. Pour the mixture into the prepared dish. Flatten the cereal with the bottom of a measuring cup that has been buttered, so it doesn't stick, and doesn't burn your hands. Allow to cool completely. Pull the whole slab of cereal out of the dish. Then cut the cereal in half lengthwise. Then cut off one end at an angle and cut back and forth creating triangles. Place the triangles on parchment or wax paper. Melt the white chocolate chips with the coconut oil in a bowl in the microwave for short 20 second bursts, stirring in-between each additional 20 seconds, until smooth. 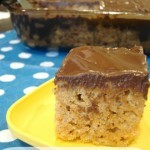 Allow the chocolate to cool slightly, then pour it into a zip-top bag and cut off the corner. Zig-zag the chocolate across each Christmas tree. 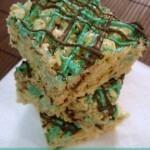 Immediately sprinkle the white chocolate with colored sprinkles. 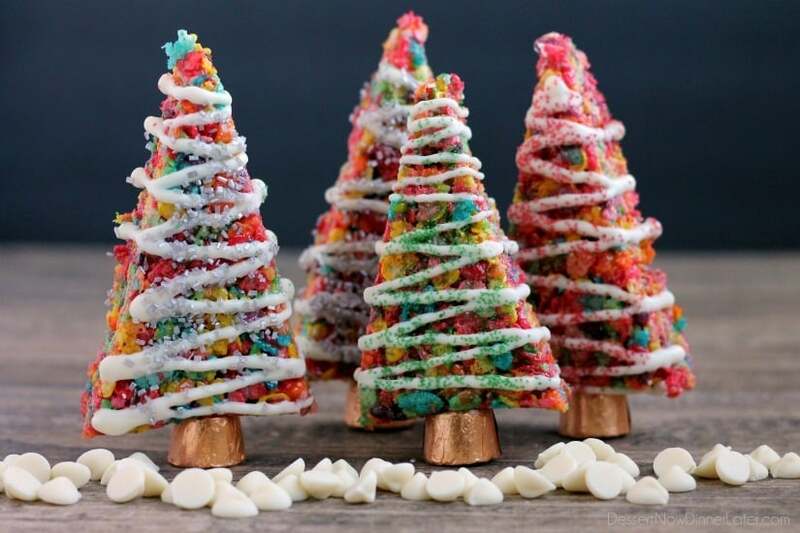 Attach the Rolo tree stumps onto the trees with a dab of melted white chocolate. Allow the chocolate to dry. 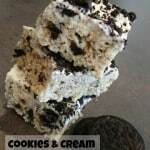 Store the treats on a plate lightly covered with plastic wrap up to 4 days. Thanks Jess! They are so fun and easy! Kids love them!